Remember Spring Fashion Week hosted by Emery over at moms are for everyone!? I'm tickled pink to report that the Summer edition is right around the corner. Friends, here's what I'm thinking. You really, really, really should join in the fun too. You have a bit of time to ponder participation and more importantly to start putting your outfits together. The rules are really simple. Emery explains it best here, but I'll take a stab at it. Take a photo of your beautiful self highlighting your fabulous fashion. Post your picture on your site for all the world to ooh and ahh over. Visit moms are for everyone! and publish your post on her link list before checking out all the other fancy participants. Do that each day for a week. OK, ok, so you need an incentive? Well, each link that you post represents an entry into a fabulous (as yet unnamed) giveaway. Not that you'd do it for free stuff, right? 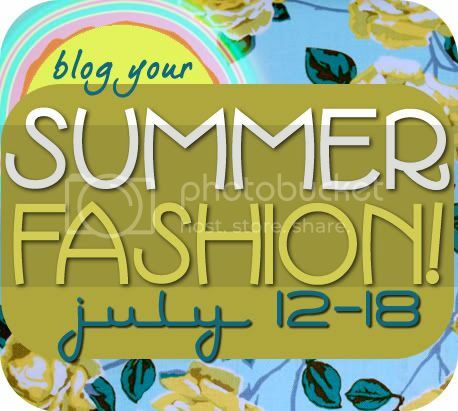 Seriously though, let your love of fashion and your desire to make new blog friends and steal their mad styles convince you that Summer Fashion Week NEEDS you.